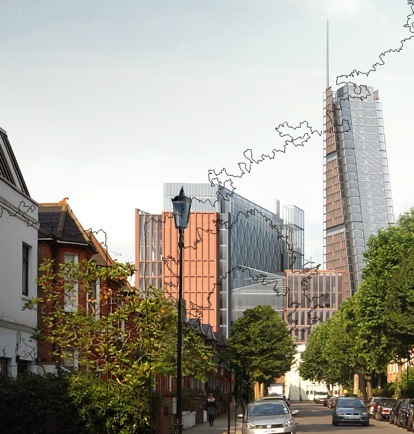 The series of posts below explain that our residents association is continuing to prepare a judicial review application, challenging the decisions of Hammersmith and Fulham to issue a planning permission for the second phase of the Imperial West development. The planning application was approved by the council’s Planning Applications Committee on July 25th 2012. Six months of negotiations between Imperial College and the council then followed. The planning permission was issued on December 21st. We are asking local residents and businesses to contribute to our legal costs. Having raised £2,500 previously from amongst our 280 members (a sum which was then matched by the Kensington Society) we are concentrating this time on the households that will be most affected by the Imperial West development. These are the houses in Oxford Gardens, and the southern ends of Wallingford Road, Finstock Road, Balliol Road, and Wallingford Avenue. We ask all these households to think what the development will mean for the daily views they have of their streets, and from their windows, and what they are willing to contribute to try to force a rethink on the proposals. If the planning approval was quashed by the courts, the current politicians in charge of the council may have second thoughts. And the May 2014 Borough elections are not that far away. As a first stage in a Judicial Review, our lawyers sent to the council last month a ‘Letter Before Action’. This sets out two grounds, as advised by a leading planning QC, which render the council’s decision potentially unlawful. The council has since replied to this letter and this response is being reviewed by our lawyers. the council acted unlawfully by granting planning permission for a development which is in conflict with is Core Strategy policy on affordable housing, without any or any adequate reasons and having misdirected itself as to the correct meaning of policy. The details of our claim are at this link Webster Dixon Letter before Action. Local residents may be familiar with the long history of the White City Opportunity Area Planning Framework. More background is on our campaign website at www.imperialfolly.org.uk. In a nutshell, the council intended to have this ‘strategic planning framework’ in place before it considered the Imperial West application. But it has never republished the draft version, let alone gone through the necessary statutory consultation process before adopting this document as part of its planning policies. Many believe that this 18 month delay in republishing the WCOAPF results from the case that the council lost in the courts in March 2012, when its decision to adopt a similar document for Shepherds Bush Market was ruled unlawful in the Wakil case. The challenge to the Imperial West decision is not a first for the council. Other decisions on the proposed developments at Earls Court and Shepherds Bush Market are also being challenged through the courts. Please help with whatever contribution you can make. This legal battle is not just about the Imperial West development, but also the future of the whole area to the west of the Borough boundary. This includes the Helical Bar proposals on Wood Lane (with a second 32 storey tower proposed) and which Hammersmith & Fulham are about to decide on. The council has pushed the boundaries of the planning system too far in recent years, and only concerted action by the public will ensure that its planning juggernaut is stopped in its tracks. The Association is working with lawyers Webster Dixon and leading planning QC Gregory Jones, on a judicial review application to challenge the decision of Hammersmith & Fulham Council last December to issue a planning permission for Phase 2 of the Imperial West development. More details are on our campaign website at www.imperialfolly.org.uk. We need to raise some more funds, roughly doubling the £5,000 already contributed by local residents (including a matching contribution from the Kensington Society). Please contact us at sthelensassn@aol.com if you can donate something, however large or small. This legal action against the council will be joining other similar Judicial Review cases. The first of these was mounted by the shop-keepers of Goldhawk Road against the proposed Shepherds Bush development, and led to the High Court declaring as unlawful the council’s Supplementary Development Plan for the area. Further judicial review applications are making their way through the courts on the Capital and Counties scheme at Earls Court. Rarely has a local planning authority found itself at the wrong end of so many legal challenges. But then rarely has a council played so fast and loose with the planning system, in its efforts to appease developers rather than listen to the views of the public. Stanhope PLC and the BBC are in the early stages of preparing 3 planning applications to redevelop the site of the BBC TV Centre on Wood Lane. The plans involve opening up the site to the public, retaining the listed buildings and Studios 1-3, and building new offices and up to 1,000 housing units. Under the partnership agreed between the BBC and Stanhope, some BBC production (and live shows) will remain on the site. More details are due to be published on a new website for the development. a revised application for the Crowthorne Road development – one storey less in height but but otherwise essentially unchanged. We have sent in updated objections to these proposals. rumours (not yet confirmed) that the Alpha Plus Group may be submitting a revised application for their plans to relocate Chepstow House School to No.49 Bassett Road. a welcome decision from the council to let Mountgrange Heritage estate agents stay at 59 St Helens Gardens, with the addition of a flower kiosk on the adjoining pavement. New Government policies on planning will have a significant impact on Kensington & Chelsea over the next few years. Policies to encourage ‘growth’ involve relaxing planning rules on change of use from business to residential. Rules on the size of extensions allowed under ‘permitted development’ are also being relaxed (although these changes will not apply in conservation areas so will not have much impact locally). On the new freedoms to change the use of B1 business premises to residential, the council has major concerns over loss of employment and will be seeking an exemption from this policy, within the Borough’s main business areas. Whether the Government will grant such an exemption remains to be seen. Meanwhile the council has been reviewing and strengthening its policies on basements. It will be bringing in tougher controls over what is allowed, with additional conditions to reduce nuisance to neighbours. Anyone planning to build a basement (and there are a growing number appearing on the St Quintins Estate) needs to be aware of these changes. The Association monitors planning applications in the area, and where proposals do not meet council policies (e.g. on basements or rooflights) the Association will normally submit an objection. It is in the collective interests of all residents to maintain the quality of this conservation area. Our web page on Conservation has more details of council policies.